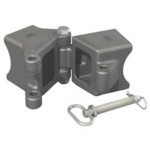 Fulton High Performance Series Fold-Away™ coupler and hinge kits are ideal for boat trailers that can be just a little too long to fit inside smaller garages. 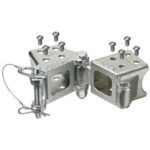 These high quality, precision engineered products provide three options for solving this common problem. Choose the Fold-Away™ product that fits your needs from among several varieties made to fit standard trailer tongue dimensions. Models with Z-Max 600-hour zinc plating provide protection 6 times longer than typical zinc finishes.